The 300-room beachfront Shangri-La’s Hambantota Resort & Spa opened yesterday on a 145-acre former coconut plantation on the southern coastline of Sri Lanka. The President of Sri Lanka, His Excellency Maithripala Sirisena, officiated at the launch, joined by guests from Colombo and the local community to mark the arrival of a new standard of luxury in the “Pearl of the Indian Ocean”. Nestled beside the Indian Ocean and framed by swaying king coconut trees, the resort doubles as a quiet retreat or spirited getaway, with some of the world’s most captivating wildlife and exotic birds in nearby national parks. The island nation boasts a colourful heritage, and its southern coast caters to leisurely exploration with historic temples, quaint fishing villages and secluded beaches. Showcasing the essence of the tropical setting is the resort’s open-air lobby – made of natural materials and dotted with local handicrafts. Upon arrival, guests are met by turquoise sea views, the sound of breaking waves and Indian Ocean breezes before they are whisked away by electric tuk-tuk to their private guestroom. Beginning at 48 square metres, the guestrooms feature louvered shutters and polished wooden floors that lead to balconies suited for admiring the resort’s lush garden – where peacocks can be spotted roaming the grounds – or ocean vista. Handwoven rugs and ocean blue-coloured panels complement the modern luxury style, and spacious bathrooms are accessorised with stone-clad bathtubs and rain showers. Each of the 21 suites, ranging in size from 96 to 240 square metres, provides the ultimate in privacy and butler service. Thoughtfully designed with a balcony and oversized rattan furniture to lounge in, the interiors reflect the island’s beauty through vibrant colours and look out to the emerald green hues of the fairways or Indian Ocean. All guests can stay connected with free Wi-Fi. 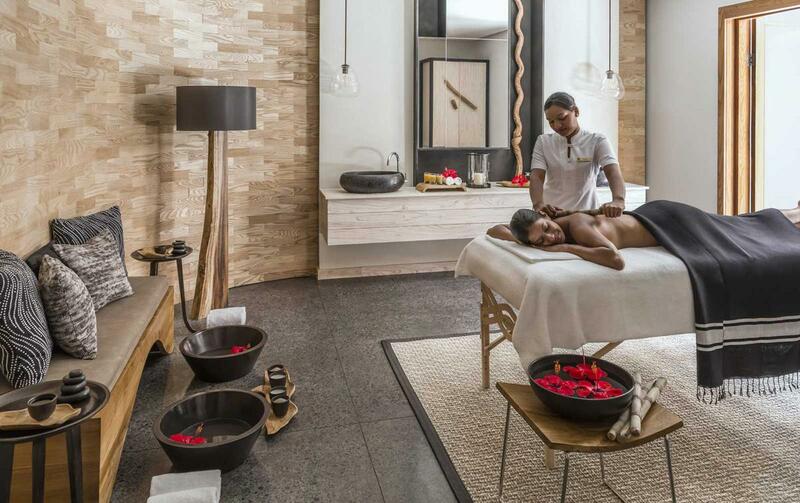 Spa enthusiasts can indulge at CHI, The Spa, where Ayurvedic treatments are delivered using 100 per cent organic herbs and natural products after a personal consultation with the guest. In all, twelve indoor and outdoor treatment rooms are a haven for stress relieving massages, facials and body treatments, and a treat for the senses. The sun-drenched setting of Shangri-La’s Hambantota Resort & Spa encourages guests to bask by one of three salt-water swimming pools, including the Sunset pool and a freeform pool, that blend with the resort’s scenic landscape of flora and leafy surrounds. Golfers can expect to be challenged on the par-70 course at Shangri-La’s Golf and Country Club when it opens in mid June. The resort is the first in Sri Lanka to have its own golf course. Designed by Rodney Wright, it encompasses a revitalized former sapphire mine. Players encounter three zones that present infinity ocean views, wide fairways and testing water and bunker features. Lush vegetation and birdlife can be seen along the 5,584-metre long course of salt-tolerant grass. Eco-friendly attributes include the use of degradable organic balls (filled with fish feed) at the driving rage and an irrigation system that harvests and recycles rain water for the course. With pleasant temperatures most months of the year, outdoor experiences along nature trails are ideal as is taking up one of the resort’s many recreational pursuits, including beach volleyball, mountain biking and jogging. Enhancing the already extensive list of resort activities is an on-site Health Club offering state-of-the-art fitness facilities, yoga classes and stretching. Young guests, from four to 12 years of age, will find their paradise at the resort’s ‘Cool Zone’, which is dedicated to fun and educational supervised activities. It is the most extensive Kid’s Club on the island. Primed to be popular are arts and crafts, a flying trapeze, the drone flying experience, trampolining and the water park. The resort is conveniently situated to view marine mammals off Tangalle Coast and to visit the family-friendly Kalametiya Bird Sanctuary as well as the Rekawa Lagoon and Mangrove ecosystem. Providing a first-hand window into the local culture, Kadamandiya Village enables guests to learn about the artistry of rural craftsmen that keep the traditions of Sri Lanka alive. Five traditional studio huts house artisan weavers, sculptors, painters and potters. Their hand-crafted creations are available for purchase in the village to support the artists. In the evening, Kadamandiya Village is transformed to stage scheduled dance, music and Angampora – Sri Lanka’s indigenous martial art – performances amid servings of local cuisine and refreshments. A selection of four restaurants and bars allow guests to experience a culinary adventure without venturing off property. Among the offerings are Bojunhala for international buffet and Sri Lankan specialities or Sera for hawker-style stalls featuring flavourful cuisines of Southeast Asia. Ulpatha or ‘Watering Hole’ is home to one of the finest selection of malt whiskies, while Gimanhala prepares fresh drinks after morning yoga, all day refreshments and cocktails by candlelight. Providing an environment for inspired experiences, the resort’s abundant outdoor spaces provide various settings for different occasions – whether it is a destination wedding set under palm trees or under the moonlit beach, or a gathering of meeting delegates. The resort’s multi-purpose 2,525 square metres of event space encompasses the most extensive hotel banquet and meeting facilities in Sri Lanka. Supported by outdoor pavilions and a ballroom that host up to 1,000 guests, additional function rooms – Kandy, Hatton and Badulla – offer a combined space of 84 to 91 square metres for 100 or more guests. Smaller venues Haputale and Nuwara Eliya span 70.5 square metres and accommodate up to 84 persons. Shangri-La’s Hambantota Resort & Spa, Sri Lanka is offering a variety of opening packages, including an all-inclusive offer for two, priced at US$247 per night, valid until 22 December 2016. Room rates start at US$216, single or double occupancy, and include breakfast. The resort can be reached by air from Colombo’s Bandaranaike International Airport and Hambantota’s Mattala Rajapaksa International Airport, which is 35 kilometres away, or by car via a 240-kilometre coastal road. Shangri-La’s Hambantota Resort & Spa is the first of two Shangri-La hotels in Sri Lanka with the second hotel – Shangri-La Hotel, Colombo – slated to open next year. The group operates two other resorts in the Indian Ocean – Shangri-La’s Le Touessrok Resort & Spa, Mauritius and Shangri-La’s Villingili Resort & Spa, Maldives.